Bring the water, vinegar and salt to a boil. Prep the lids/jars. Evenly divide all of the spices, shallot and garlic between 6 pint jars . Add the cucumber spears. Pour in the vinegar mixture. Close the jars and process for 10 minutes in a hot water bath. Allow to sit 2 weeks before eating. Can you stand more canning? I have done so much canning this year, I barely have any non-canning recipes saved up to post. I am actually a little annoyed that it is suddenly so cool and I have nothing to can right now. I did a ton of canning during the long stretches of high heat and humidity we've had recently and it was pretty brutal, even though I was canning late at night so I could go to bed and escape the hot kitchen and downstairs. Anyway, these pickles are really good. I wanted to make a sandwich slice that was different than the spears I had made and came up with the idea of a hot and spicy pickle. They are so good on a hamburger and I can't wait to have them in the middle of a grilled cheese sandwich. YUM! Tip: It is a little harder to gauge how many slices fit in each jar since they are sliced and not always evenly so make sure you prep a couple of extra jars just in case. Steam the broccoli. Drain thoroughly. Finely chop or pulse briefly in a food processor. Saute the shallot and garlic in the olive oil. Allow it to cool slightly. Add the broccoli, sun-dried tomatoes, shallot, garlic, cream cheese, sour cream and spices to a large bowl. Use a mixer or spoon to combine. Use immediately or refrigerate until ready to eat. 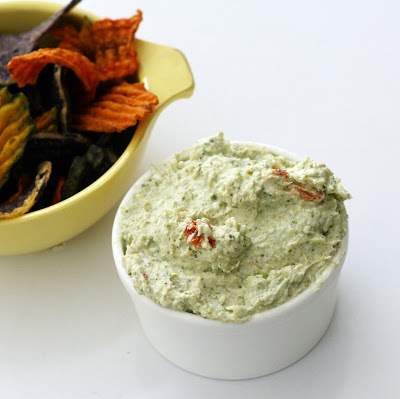 When I tried these Terra Chips that had carrots, blue potatoes and kobocha in them, I knew I had to make a vegetable-y dip. We had an abundance of broccoli so I steamed some up until it was tender then gave it a whirl in the VitaMix. I had some some sun-dried tomatoes so I added that along with some reduced fat cream cheese and sour cream. I mixed it together in my stand mixer using the whisk attachment and it came out really light and creamy. I normally don't use a mixer for dips but I might always now, it really combined everything in just a few seconds. The broccoli flavor in this dip is mild and contrasts nicely with the sharp sun-dried tomatoes. I like that is so packed with vegetables because then it doesn't seem like such an indulgence to have some dip and chips with my lunch! Prep 3 quart jars. Peel, core and halve the pears. If you'd like, float them in water mixed with Fruit Fresh or lemon juice, to help retain their color. Pack them into the jars. Meanwhile, bring the sugar, tea bags and water to a rolling boil. Do not let it reduce. Pour the hot syrup into the jars, leaving 1/2 inch headspace. Run a knife or a jar scraper to dislodge any bubbles while turning the jar slightly. Seal. Process in a hot water bath for 25 minutes. Note: This recipe yields a bit more syrup than you will probably need. I scaled it this way because while my 10 pears fit into 3 quart jars, you might have some leftover. There should be enough syrup leftover to can a pint of extra pears if need be. This week's Tazo secret ingredient was pears. I was trying to think of something that wasn't too autumnal to make. Pears are just coming into season but I am more into peach-berry-tomato mode than pears and apples right now. So I was turning that around in my head for a while and decided I would pair them with the quintessential summer drink, sweet tea. I thought about making some sort of granita or some other frozen dessert but the sort of grainy texture of Bartlett pears made me think it might not be as smooth as I'd like. So I decided to can them in a light sweet tea syrup. 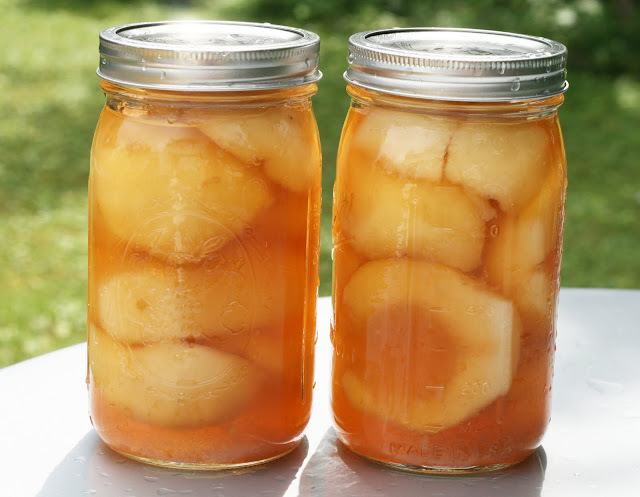 Most recipes I found for canning pears use the hot pack method where you heat the pears through in the syrup but I think that makes the pears a little mushy. Instead I decided to process the pears more like peaches so they would hopefully retain the shape and texture better after the long processing time. Prep grill according to manufactuers' instructions. Lightly oil the grates of your grill and a grilling pan. 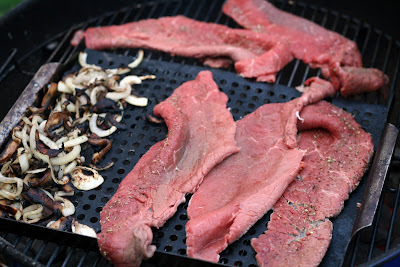 Arrange the onions and mushrooms on the grilling pan and cook, tossing occasionally, until soft. Towards the end of the cooking time, grill the rolls directly on the rack. Set aside. Push the onions and mushrooms to one side. Sprinkle the meat with salt, pepper and oregano on both sides. Arrange the steaks on the grill. Cook until very nearly cooked through. Stack 2-3 steaks on the the grilling pan. Top with cheese and allow it to melt. Place on rolls and top with onions and mushrooms. *1/8-1/4 inch thick. Our local store sells them 3-4 to a tray labeled as "rolling steaks". 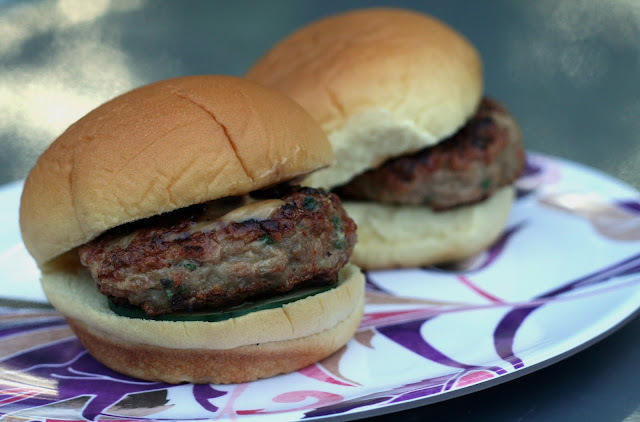 This is a fun and fairly easy recipe to help ease us towards the end of the summer grilling season. The only tricky part is that since the steaks are thin, they can go from delicious to overcooked pretty quickly. The same is true of the rolls so stick by the grill for this one! The whole meal takes on a lovely smokey flavor and who doesn't enjoy a cheesesteak now and again? I know in Philadelphia there is much debate about Cheez Wiz vs real cheese and what toppings are acceptable but at home you can be your own mini food truck and make them as you see fit. 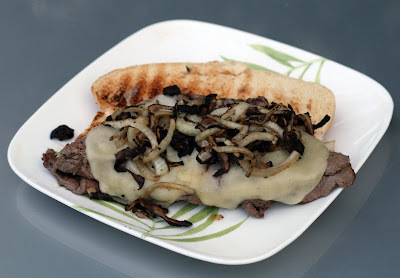 I am a fan of the onions, mushrooms and provolone combination and luckily mushrooms and onions grill very nicely. The onions caramelize quickly and with little effort. I do find that slices of steak are much easier to grill at home so resist the urge to do the shredding/chopped style that many cheesesteak shops sell, the meat cooks too quickly and tends to fall into the flames. I am taking a break from our normally scheduled recipe for an announcement. 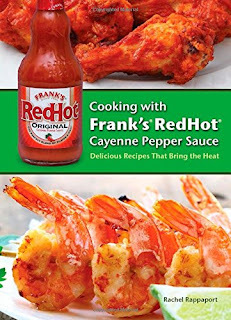 Today is the official publication date of my cookbook! I am so excited. It is hard to believe that something I spent an entire, hot summer developing and writing is available now on a library or book store shelf and of course, on Amazon. 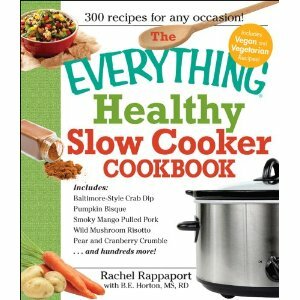 In the book you will find 300 slow cooker recipes, all with an eye towards using fresh ingredients and not a single one calls for condensed soup! I think you will enjoy it. I am giving away a copy to one lucky reader. Please leave a comment on this post to be eligible to win. The comment must include your email address. Place the quinoa, peaches and water in a small saucepan. Cook for 30 minutes then add the oatmeal and milk. Cook until the oats are tender, about 10 minutes, stirring occasionally. Meanwhile, bring the sugar and tea to a boil in a very small pan. Boil until it reduces to a syrup (about 30 minutes). Stir the quinoa mixture. Drizzle with syrup. Recently I was approached by Tazo to develop some new recipes using their tea. I received a big box of various teas to play around with and once a week for three weeks I will be sent a mystery ingredient to use in the recipe as well. Last week the ingredient was lavender and I made some yummy Oolong Cupcakes with Lavender Frosting. This week the ingredient is red quinoa. Might I admit something? I am not the biggest quinoa fan. I like the texture and the idea of quinoa but I don't love the flavor. Maybe I got burned out on it last year when I was developing recipes for the cookbook but I was a little disappointed that it was the mystery ingredient. But I rallied and decided to pair it with a seasonal ingredient: peaches. 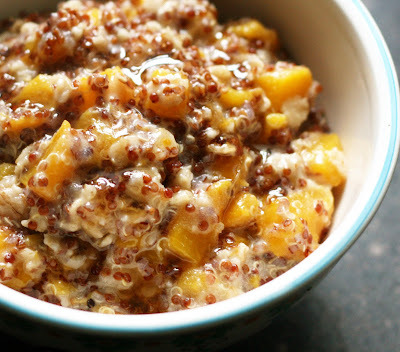 Cooked together the quinoa took on a pleasant peachy flavor and the oatmeal made it creamy. When topped with the tasty cucumber white tea syrup, it became a fresh tasting breakfast that had the texture benefits of quinoa but the flavor wasn't overpowering. Please all of the vinaigrette ingredients in a blender, pulse until smooth. Set aside. Arrange salad ingredients on a plate. Set aside. Rub freshly ground black pepper and sea salt into both sides of the meat. Refrigerate until ready to use. Heat the oil and garlic cloves on the stove or microwave until just warm. Set aside. Thread the shrimp and bread cubes on bamboo skewers. Brush the shrimp, mushrooms and bread cubes with the garlic olive oil. Meanwhile, prep grill according to manufacturer's instructions. Place the steak in the middle and the skewers around the edges. 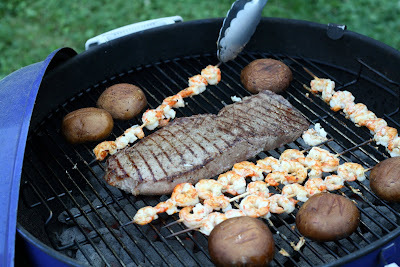 Grill until the steak is medium-rare, the shrimp is fully cooked and the bread is toasty. Allow the meat to sit five minutes. Slice thinly. 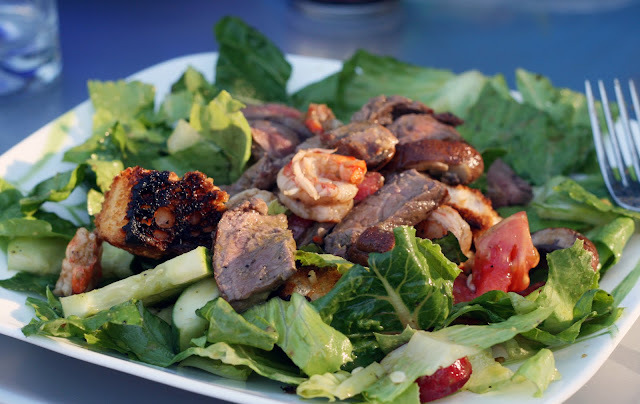 Top the salads with steak, shrimp and grilled croutons. Drizzle with vinaigrette. I know, another salad recipe. But it has been an unusually hot summer and we have pretty much given up on making anything that isn't grilled, no-cook or made in the slow cooker (save the occasional late night jam or cupcake making). The bright green basil dressing and grilled steak, shrimp and croutons make this salad fancy enough for company but is super simple. Just take care that the croutons don't burn, not unlike the shrimp, they go from "raw" to crispy very quickly. Muddle the raspberries in the bottom of a jar or dressing container. Add the remaining dressing ingredients. Cover and shake to thoroughly mix. Toss the salad ingredients together. Divide into four bowls. Drizzle with dressing. As odd as it sounds, raspberries are a good substitute for tomatoes, which are just now coming into their true season, they are sweet-tart, flavorful enough to stand up to salad dressing and their soft texture contrasts nicely with the crisp lettuce. 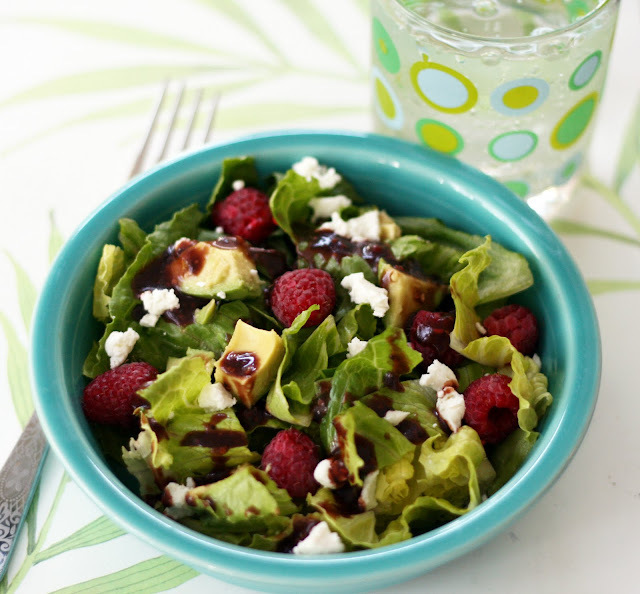 Raspberries are also delightfully mashable so it is possible to incorporate them into a salad dressing with minimal effort. I like how their texture contrasts with the avocado, I wasn't sure about the pairing at first, but it was so good, I had to share. An easy way to sneak fruit into dinner. Bring the water, vinegar and salt to a boil. Prep wide-mouth pint lids/jars. 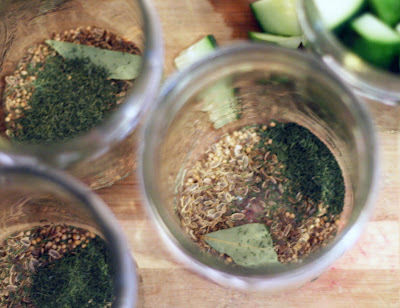 Place 1 bay leaf, 1 teaspoon mustard seed, 1 tablespoon dill seed, and 1/2 teaspoon dillweed in each jar. 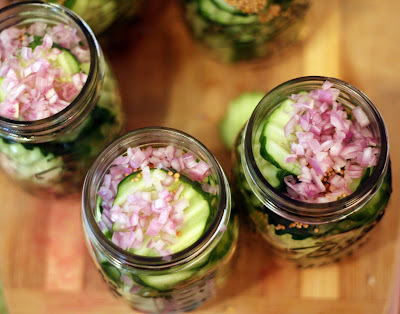 Add the cucumber spears and one clove garlic to each jar. 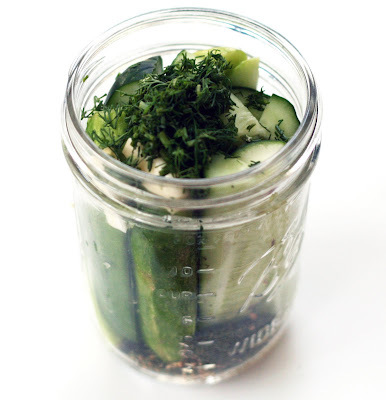 Evenly divide the dill among the jars. Pour in the vinegar mixture. Close the jars and process for 10 minutes in a hot water bath. Allow to sit 2 weeks before eating. Pickles! I sent my husband to buy pickling cucumbers the other day and he came back with 15 lbs. He helped cut up the cucumbers (thank goodness!) and I ended up canning 22 jars of pickles in three varieties. These are the first ones I've opened. To my delight they stayed pretty crisp and have wonderful but not overpowering dill flavor. I was a little worried that using dillweed, dill and dill seeds would end up being too much but it really wasn't. 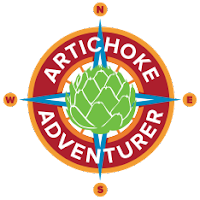 There was just a depth of flavor that one normally doesn't find in a pickle. I hope the other ones I canned turned out just as well! After a while, I felt like I was living in a pickle factory and I think I developed "pickle wrist" from trying to really pack the cucumbers in there. But it really wasn't difficult at all, just a little time consuming. Bring the milk and tea to a boil. Remove from heat and allow to cool to room temperature. Discard the tea bags after thoroughly squeezing out all the milk back into the pan. Preheat oven to 350. Line or grease and flour 6 wells in a cupcake pan. Place all of the ingredients in a large bowl and mix until well combined. The batter will be rather thin, so don't be alarmed. Fill each well 2/3 of the way full. Bake about 15 minutes or until a toothpick inserted the center of a cupcake comes out clean or with just one or two dry crumbs. Cool briefly in the pan, then remove cupcakes to wire racks to cool completely before icing. Beat the egg whites and salt to soft peaks using an electric mixer. Meanwhile, in a medium saucepan, bring sugar, lavender and water to a boil, stirring occasionally. Continue to boil until it reaches soft ball stage (when a drop of the syrup forms a soft ball when dropped in cool water) while continuing to stir occasionally. Whisk the mixture through a fine sieve into a heat safe measuring cup and discard the lavender. Keep the mixer running (to be safe use a stand mixer or a friend to complete this next step) and pour a continuous stream of molten syrup into the egg whites. Continue to beat for about 5 minutes or until the frosting is fluffy, glossy and cool. Frost cooled cupcakes. Recently I was approached by Tazo to develop some new recipes using their tea. It is actually quite fun, I got a big box of various teas to play around with and once a week for three weeks I will be sent a mystery ingredient to use in the recipe as well. I was excited for the challenge, after 6 plus years and nearly 1,100 original recipes, sometimes a culinary puzzle is welcome. This week it was culinary lavender. I haven't made anything with lavender before so that was an interesting twist. I had lots of ideas but I decided to go classic and make some cupcakes. Who doesn't love cupcakes? No one I would like to know. 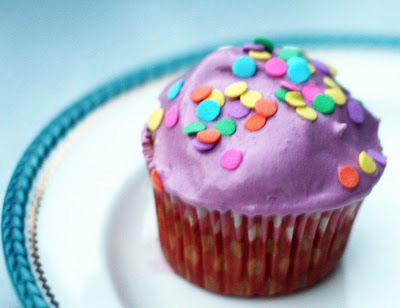 These cupcakes are more for grown ups than the little ones I think, they are subtly flavored and not overly sweet. The cupcakes themselves taste like milky tea and are quite light textured. I love how the fluffy lavender frosting turned out, that is one of my favorite types of frosting to make and as I hoped, the lavender flavor was strong but not overpowering. I did add a little dye to the icing, something I don't always do but I was worried the icing might look grey or a little "off" left unadulterated. I also made a bit too much frosting so if you double the cupcake recipe, I think you could use this same frosting recipe without alteration and have enough to frost all of the cupcakes, it is just a tricky recipe to scale down any further than I did. In a small bowl, whisk together the dry rub ingredients. Rub into the pork. 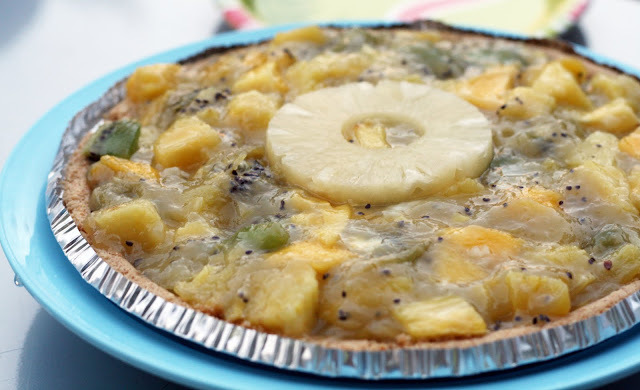 Attach the pineapple slices to all sides with toothpicks. 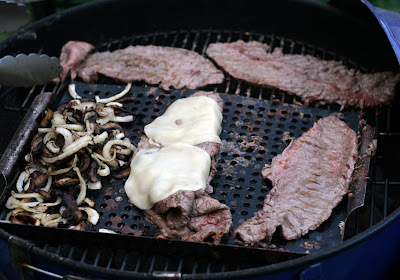 Arrange the coals around a rectangular foil pan filled with water. Place the pork over the pan on the grill. Place a foil packet of wood chips on the coals. Vent/leave the lid askew until it really starts smoking. Then cover. Cook, adding loose coals and wood chips every 30 minutes, until fully cooked. If it looks like it is cooking unevenly, turn it when you add the chips and charcoal. To keep the smoke/low heat going, occasionally vent until it gets smoky then fully cover again. Refill the pan with water as needed. After the pork has nearly reached a safe internal temperature, remove the cover and briefly cook on each side on direct heat (ie. not over the pan of water but to the side). 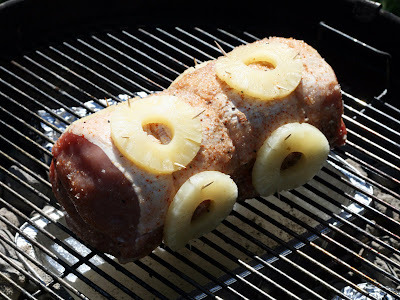 Allow to sit on a platter under a foil tent for 5 minutes before slicing. Take care to remove all of the toothpicks prior to serving. 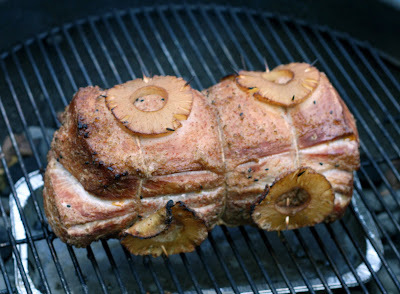 OMG this pork was so good. Insanely juicy, smoky and flavorful. It does take a while (about 2 hours, depending on the thickness of the roast) but it is well worth it. 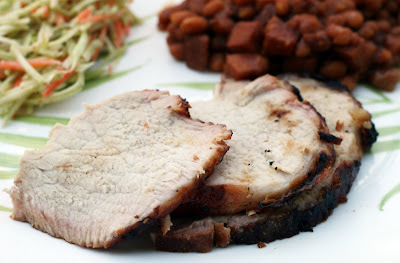 The indirect heating method is great because the meat cooks slowly and has time to take on the smoky flavor. There is also little risk of flare-ups because the roast is over the water the whole time. We made this (and the spam & beans and broccoli slaw and an not-as-yet posted ice box pie--the perfect hands free meal) when we had guests over (a delightful fellow food blogger and her husband) and it was easy to sit outside and talk and occasionally check the grill. It was pretty hands off. So don't be daunted by the adding of charcoal and wood chips part of the recipe, it truly is dead simple. Place all ingredients in a blender and pulse until smooth and well combined. Pour into ice pop molds. Freeze until solid. I sometimes hesitate about posting such simple recipes but the combination was so surprisingly good, I didn't want to keep it to myself. Ice pops are great for using up fruit, I recently had a ton of kiwi on my hands, enough that I made jam and a pie and these ice pops and still had some leftover. That is a lot of kiwi! 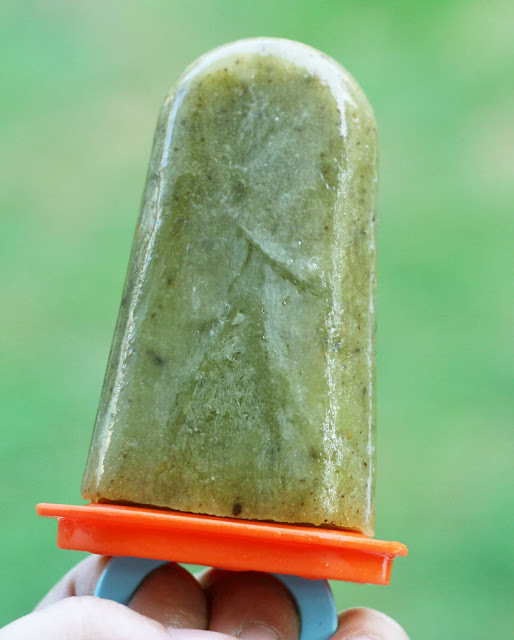 Kiwi has a high water content so you don't need to add any juice (I just added the lemon juice for flavor) or water or anything to make it the right consistency for a superior ice pop. The lemon added just a bit of tartness to my very sweet kiwi and the galangal added a background note of spice that kept it from being just another boring ice pop. In a small bowl, whisk together the dressing ingredients until smooth. Toss with shredded vegetables. 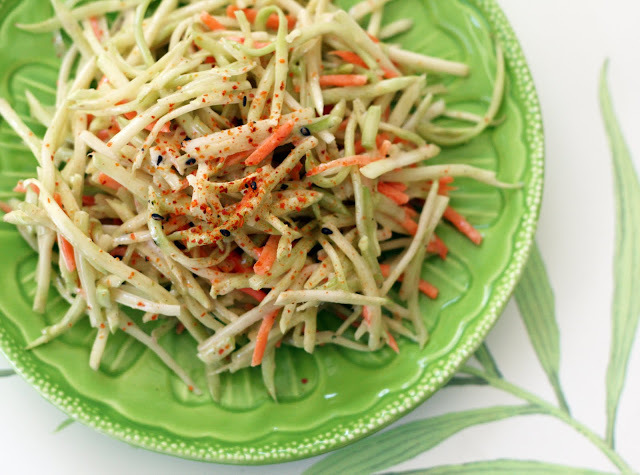 Broccoli slaw is a fun alternative to regular coleslaw. 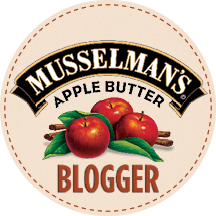 It it is generally a little crisper and the flavor is milder then you'd expect. I also like it because it can be made nearly 24 hours in advance to serving and little to no ill effect which makes it the perfect side dish when having company. Just refrigerate it until you need and give it another toss. The flavors in this are Japanese inspired but in no way do I think this is a traditional Japanese salad! The flavors are a perfect blend of tart and spicy and there is just enough to mayo to bind the dressing together.